it`s extremly blurry! whitch is not good! and as everyone has said..the scan doesn`t match the setting. The backgrounds kinda weird for the picture, but other than that this is a nice wall. I agree... the scan does need more work on the extraction and I believe that it is of low quality since it is all blurred. aaaaaaaaaaaaaaaaaaaaaaaaaaaaaaaaaaaaaaa!!!!!!!!!!!!!!!!!!!! XD XD XD i love fruits basket! i love it! you did a great job on it too! 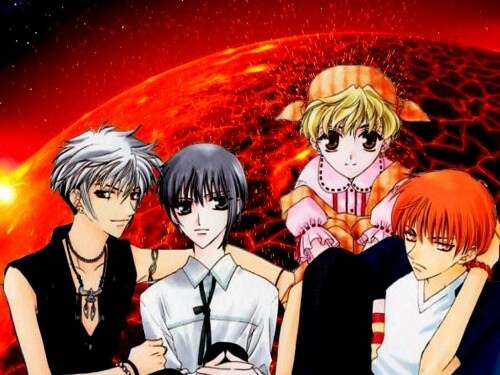 more fruits basket~ yay! woot woot! i think that the scan ish pretty blur.. and the bg doesnt suit the scan very much.. I agree with the others, the scan is blurred. And also I think the background doesn't fit with the scan. the image is good, though i feel that the background feels a bit unsiutable for this image. something more bright and cheerful will be better, in my opinion. Nice artwork. Nice to see Haru giving Yuki a little hug, it's cute.